Hepatitis B is the most common serious liver infection and is the cause of up to 80 percent of all liver cancers worldwide. Unfortunately, even though overall liver cancer rates are decreasing thanks to available vaccines, disparities in education and health access continue to put Asian Americans, Native Hawaiians and Pacific Islanders (AA&NHPI) at a clear and critical disadvantage—over half of the estimated 2 million people infected in the United States are AA&NHPIs and this group is 2.4 times more likely to be diagnosed with liver disease than non-Hispanic Whites. 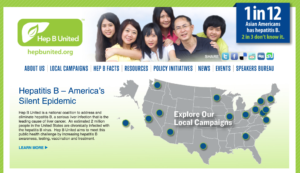 1 in 12 Asian Americans has hepatitis B. Could you be one of them? Get tested. Get vaccinated. Get treated. 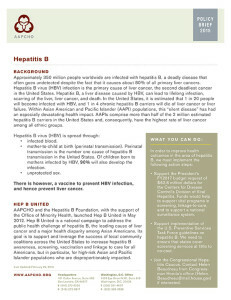 Hepatitis B: What Asian and Pacific Islander Americans Need to Know fact sheet, also available in Chinese, Korean, Tagalog, and Vietnamese. H.R.3974 – The first viral hepatitis and liver cancer prevention legislation. Learn about AAPCHO’s efforts with Hep B United. PSA by AAPCHO, the Office of Minority Health and the Hepatitis B Foundation.